I planted the cut top of a supermarket pineapple in a pot of soil quite a few months ago, ignoring it for the most part, but watering it with other bromeliads in my routine of giving the whole garden a drink. This morning the fruit begged to be harvested. 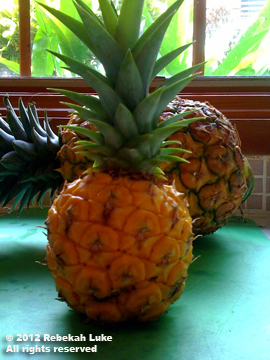 It was just as much work to prepare for eating as a larger pineapple, but I treated it like gold. Very tasty and refreshing, nutritious, ripened by the sun, and free! Mahalo e ke Akua no kēia mea ʻai. 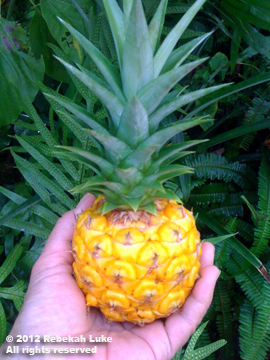 Mini homegrown pineapple. It doesn’t get any fresher than this! 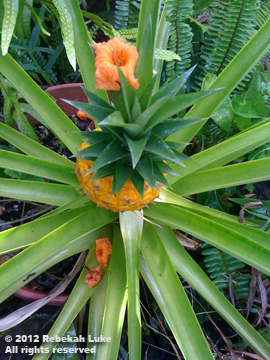 Homegrown mini pineapple compared to a commercially grown pineapple behind.